Baby gorilla hitches a ride on its mother's back; sadly, the Eastern gorillas are very close to extinction. 1. 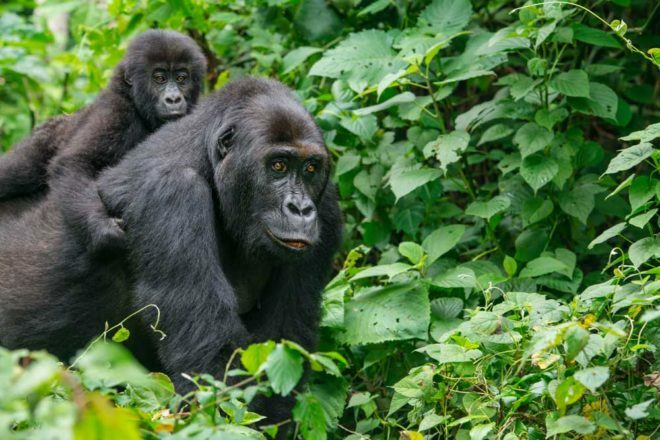 The Eastern gorilla is now critically endangered, i.e. one step away from extinction. 2. Apple’s wireless AirPods; an expensive exercise in misplacing your headphones. 3. The Martini ice cube that detects when your drink is running low and orders another; does it also judge when you’ve had enough? 4. Hotel credit card pre-authorisations sucking up more and more of your holiday funds. 5. The Travel Bra that allows you to store cash, credit cards and even your passport in it; clearing customs will be interesting.